From the 1890’s Oklahoma State suffered from the Aggie moniker that so many other state schools donned. Their team name was actually the Tigers. Nobody liked it so around 1923 they looked for a new mascot to replace the one they ripped off from Princeton, school colors and all. Some of the kids spotted Frank Eaton leading a parade and hit him up to be the model for the new mascot. Oklahoma A&M eventually renamed to Oklahoma State and for 35 years Frank Eaton was the real life mascot for the university. In 1958 they renamed the mascot to “Pistol Pete” and each couple of years a new student becomes the fabled Cowboy. Bullet has a more recent history. In 1984 the band director the president of Oklahoma State’s Rodeo Association banged heads and decided to start another tradition. 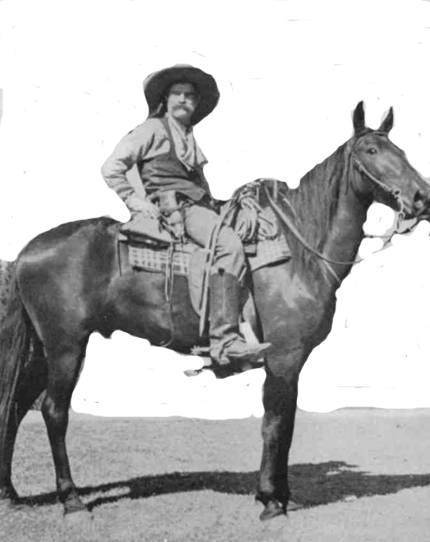 For every touchdown scored by the Cowboys, the ‘Spirit Rider’ would lap the field riding the horse. It was well like that after the kids graduated, the university bought a black horse and the students voted the name of the horse to be Bullet. Now every year a new Spirit Rider mounts Bullets and fires off across the field. Why didn’t we mention Spirit Rider as a mascot? Because they blatantly admit ripping off the Texas Tech mascot. That and Pistol Pete is way cooler. 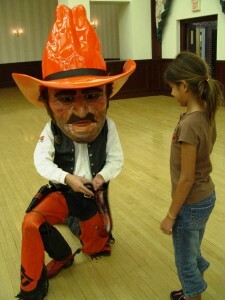 Pistol Pete’s get up takes a small turn from other types of mascot costume. The costume is the typical huge head with man body. The man body is what you would expect from a cowboy: a vest, jeans, cowboy boots, Oklahoma State colored chaps, spurs, and some pistolas to bang out when the time calls for it. The huge head is where it takes a turn. Where one would expect a fluffy type face, complete with stringy haired mustache and super bendable 10 gallon hat, we actually get a molded plastic head. He looks mean, but he also looks shiny. Shiny is not what you would expect if you dig deeper into the inspiration for Pistol Pete. Frank Eaton was a true cowboy. When he was a kid back in the 1800’s, he witnessed his Yankee dad getting capped by six southern good ole boys. Vowing revenge, he upped his skills, tracked down the vangrals, and killed all but one in gunslinging showdowns (the last died before he could get to him). Before he got too old to shoot, he sported the pins of marshall, deputy, and sheriff. So when he became Oklahoma State’s poster boy, it cemented his legend forever. 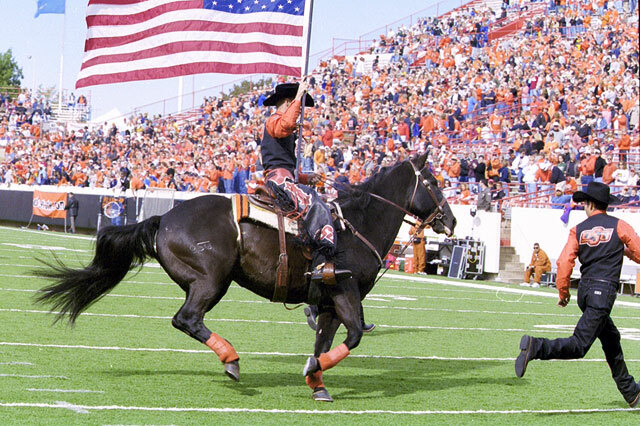 This is a most unique circumstance in mascotdom as the mascot actually embodies a real life cowboy. From what we’ve seen so far, the other mascots that took a human form usually embody some legend of spiritual or supernatural proportions. The touch of authenticity sprinkled on to Pistol Pete ranks really high with us here at the KCCGD. 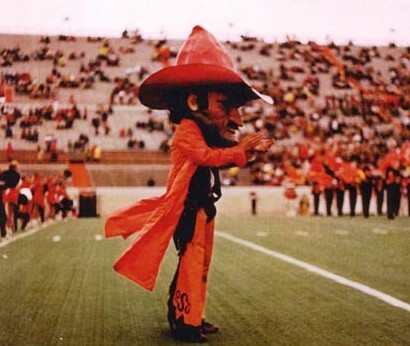 Sure the Spirit Rider and Bullwet are cute, but the rugged intentions of Pistol Pete embody what a mascot should be: an intimidating symbol of the shool’s athletic prowress. Pistol Pete hits that right on that mark, with the smoke still steaming from his six shooters.